Hi friends! 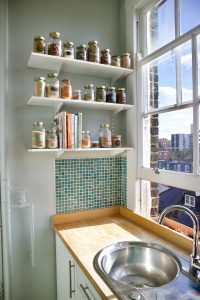 So as I mentioned last week in my 1 year roundup post, I am starting a new series on the blog called “Corner of my Home” where I hope to share with you lots of tips & ideas on how to organise your home.This week, we’re starting with the kitchen pantry! Spring is well underway – well, it should be at least! We’re having the worst start to Spring so far here in London. Its dark and gloomy and rainy all day, every day. But at least, if its not nice out yet, its the perfect excuse to spend an afternoon cleaning out, stocking up and organising your pantry. I promise, you will feel like a million bucks after this. And it doesn’t have to be expensive! With all this said, shall we get going? I think so too. Let’s start with a roundup of Kirstin’s advice on what to stock your pantry with (P.S. 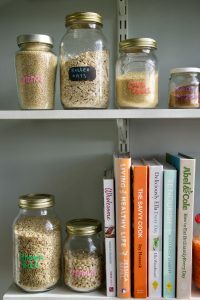 you can head to her own blog to find more details on how to stock your pantry). These ingredients are all great plant-based sources of protein and are jam-packed with gut-loving fibre! Nuts are great sources of healthy monounsaturated and polyunsaturated fats that are good for our skin, hair, hormones, hearts, and overall health as part of an overall healthy pattern of eating. They’re nutrient dense, making them a great snack or addition to meals, and are packed with fibre. 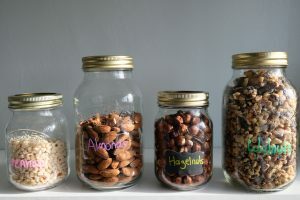 It’s always a great idea to have some nuts stored in airtight jars on the pantry shelf for easy access, but to stash larger bags of nuts in the fridge to prevent them from going rancid over time. Just like nuts, seeds are great sources of fibre, monounsaturated fats, and polyunsaturated fats. Flaxseeds and chia seeds are a great source of omega-3 alpha-linolenic acid, fibre, and polyphenols. Pumpkin seeds are great sources of omega-6 fatty acids, manganese, magnesium, and phosphorous, and sunflower seeds contain a significant amount of vitamin E.
Dried fruits make for a great sweet addition to homemade granolas or trail mix, as they are natural sources of sugar and fibre. 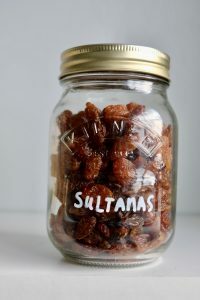 Having a couple of different varieties on hand is also useful for baking, as an addition to breakfast bowls or salads, and even as a sweet snack. All of these wholegrains make for a great base for meals. All of them are amazing sources of dietary fibre, and contain a variety of vitamins and minerals that are essential to our health. The consumption of wholegrains has been linked to decreased risk of coronary heart disease, cardiovascular disease, and total cancer, and mortality related to diabetes. Herbs & spices both make cooking and eating so much more exciting. Firstly, they add flavour and depth to food, and allow you to cut down on adding salt, sugars, and oils to recipes without sacrificing on taste. Secondly, many herbs and spices are touted as powerful weapons against illness. For example, ginger is known to minimise symptoms of nausea and vomiting and cinnamon is said to help stabilise blood sugar levels. Overall, herbs and spices are great additions to meals because they each contain unique phytonutrients, some of which can reduce inflammation in the body and have antioxidant activity. These staple pantry items are very useful for making delicious homemade dressings & vinaigrettes, marinades, and pickles. When purchasing oils, it’s always a good idea to choose higher quality (often a bit more expensive) oils as they tend to be more stable in the long-term and can taste a lot nicer. 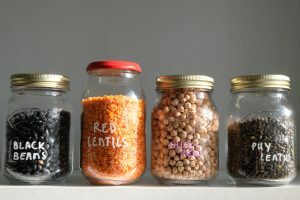 We don’t always have time to prepare legumes from scratch, so having a couple of tins of chickpeas, lentils or beans on hand can make meal preparation that much easy when time is limited. Tinned tuna or salmon are an amazing, quick source of protein, and tinned tomatoes can form a great base for many different dishes in no time at all. Some veggies do best when stored at room temperature. Although tomatoes are best stored in the fridge when they’re VERY ripe, they taste far better when left out at room temperature. Potatoes like to be stored in the dark, as do onions. 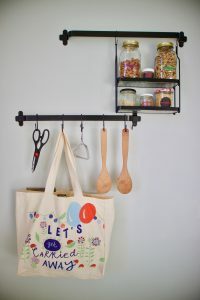 Kirstin also created a super useful printable to help you with organising your pantry basics. 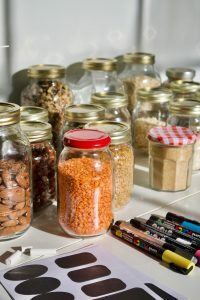 I think Kirstin and I both agree that buying in bulk is the easiest, cheapest and most environmentally friendly way of stocking up your pantry. I usually order everything off of Amazon. Its super easy especially if you have Amazon Prime. Then you get these big bags or pouches, what do you do? Glass containers will last the longest, they will not get scratched up like plastic will. But I think my most important tip is that your containers should be see through. You don’t want to open up your flour container only to realise you don’t have enough for your recipe. Its also such an easy way to keep track of how much you have of everything. 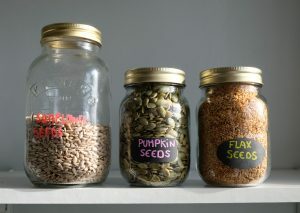 Mason jars are always a good way to go but there are tons of other options out there. There are tons of options and they really don’t have to be expensive. You can also recycle your own jars – such as your pickle, mayo or marmalade containers. See? Easy! No excuses. Haha. Now I know you may think you know what everything is and you might think this is a useless step, but trust me. There’s nothing worse than mixing up your self raising flour with plain flour. 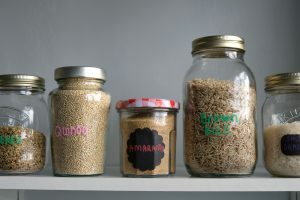 Plus, if you’re in the kitchen with your little ones for example, you can easily delegate them the tasks of getting “the mason jar with the pink writing!”. With Kirstin, we used two labelling techniques. I got these black labels you can just write with chalk on although I find it quite hard to have a neat handwriting with chalk – make sure you get large labels so you have plenty of room to write. 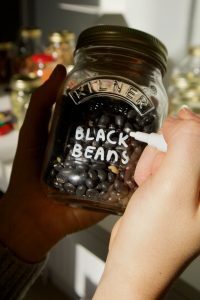 We also used these chalk pens onto the glass directly, which you can easily rub off with water if you want to change the content of the jar. 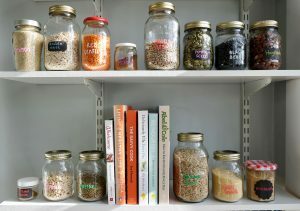 Organise your pantry by category! 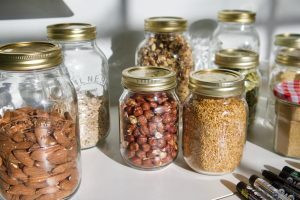 If you’ve followed Kirstin’s advice I mentioned earlier, you’ll know what kind of categories I’m talking about: Legumes, Nuts & Seeds ; Herbs & Spices ; Grains & Flour ; Vegetables & Dried Fruits…etc This will make it much easier to find what you’re looking for AND to whip up a balanced meal in a flash. Remember, Kirstin made these awesome printables to help you with your organisation! 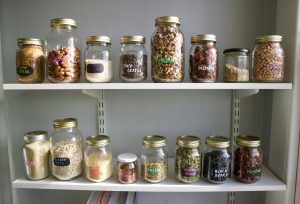 Make sure all of your containers are visible when opening your pantry! Seriously, this is such a silly piece of advice but it would be so stupid to buy multiples of each item only because you didn’t see what you already had. Its a waste of space & money! In Kirstin’s kitchen, she has these shelving units just above her sink, which are just perfect to store all of these containers. Plus, its actually looks quite aesthetically pleasing! But if you don’t have this kind of storage unit, you could also get some baskets you could organise into categories of foods. So for example, put all of your legumes, nuts & seeds in one basket and all your grains & flour in another. 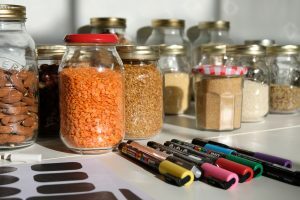 Either lay your containers flat with the label facing up or place them vertically with a label on the lid so you know exactly what you have without having to take anything out. I hope you enjoyed this first post of this new “Corner of my Home” series. Do let me know what you would like to see next! Thank you again to Kirstin for helping me out with this blog post!! Go check out her blog for lots more useful advice on nutrition. 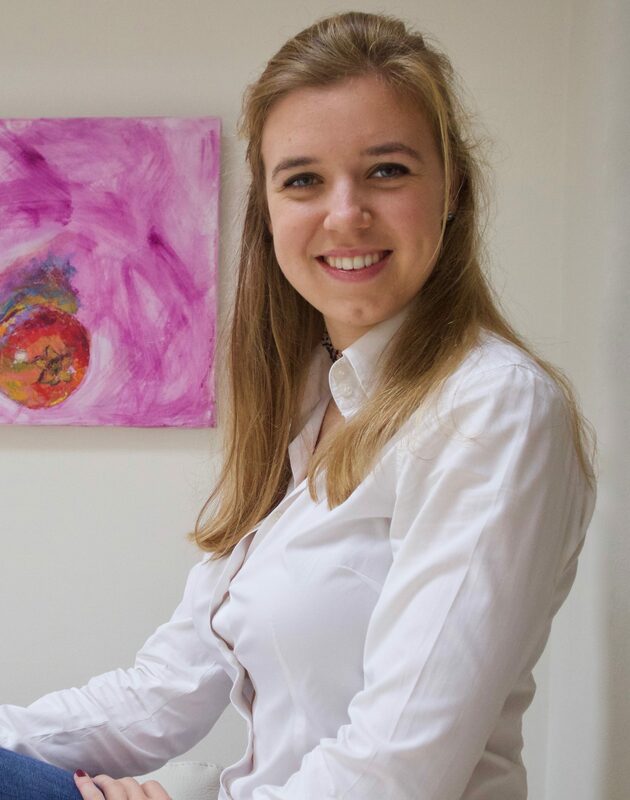 Oh thank you so much Éléonore! Yes that’ll be super handy for next year! Its a student budget friendly project!